Whether you need a sit down or your children want to use the play area or see the rabbits, please feel free to use the facilities at any time. In fact we’re more than happy for you to bring your little ones to use the play area, even if you’re not picking or visiting the shop specifically. Throughout the summer picking season we will be open every day, at least 10am – 4pm. 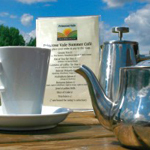 In fact we are happy to serve you a hot drink throughout the year whilst your children play – just ask!